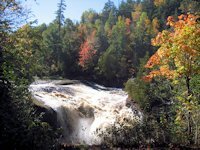 Houghton is the gateway to the Keweenaw Peninsula, an unspoiled mecca of scenic travel and outdoor recreation. On our early travels to the Keweenaw, we rushed through Houghton and Hancock anxious to get to Copper Harbor. But now we stop and enjoy what the community offers. 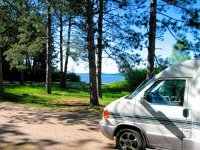 We usually stay at the Houghton RV park along the Portage Waterway, one of the nicest public RV parks around Lake Superior. From there we can walk the scenic waterfront trail to downtown or drive the short distance if it is raining. Plenty of free parking along the downtown waterfront. Attractions downtown include restaurants like the Ambassador (great pizza and Italian food), the Library Restaurant (more upscale dining), and Joey's Seafood & Grill (the place to go for fresh seafood including Lake Superior Whitefish). We also like the Keweenaw Brewing Company serving a variety of home brews at a reasonable price and ample amounts of peanuts-in-the-shell also at a reasonable price. Other attractions, besides waterfront recreation, include the Portage Lake Golf Course, the A.E. Seaman Mineral Museum at Michigan Tech, the Quincy Mine across the waterway in Hancock, and the nearby F.J. McClain State Park. Annual events include the Michigan Tech Winter Carnival, Bridgefest, the Parade of Nations celebration, and arts and crafts fairs. Early in its history Houghton was a major shipping port serving the copper mining industry that thrived in the area for about 100 years. Now the former industrial waterfront has been attractively renovated for recreational use, including swimming, boating, fishing, biking, walking, concerts, picnics and the like. Now the biggest ships usually docking at Houghton are cruise ships touring Lake Superior or transporting visitors to Isle Royale. Houghton's most famous landmark is its Aerial Lift Bridge, one of two we know of around Lake Superior (the other being Duluth's Aerial Lift Bridge). The first bridge across the waterway was a wooden swing bridge constructed in 1875. In 1901 the 100% wooden swing bridge was replaced by a steel main bridge with a wooden swing section, but the extremes of weather and the increasing amount of automobile traffic made this type of bridge impractical and unsafe. In 1959 it was replaced by the current Aerial Lift Bridge. Its double deck construction originally handled rail traffic on the lower level, but since rail traffic to the Keweenaw was discontinued the lower level is only used in the winter time for snowmobile traffic. Bridgeview Park is located along the Waterfront Trail. In addition to the historical information kiosk (shown at the right), it offers picnic tables, recreational boat docking, and scenic views of the bridge, Portage Waterway, and the Hancock Skyline. The four mile Waterfront Trail, popular with walkers, joggers, bikers, and skaters, runs from the Waterfront Park, west of downtown, past the Michigan Tech Campus, east of downtown, to the Nara Nature Trail on the Pilgrim River. The Waterfront Park has a pavillion, picnic areas, a band shell that hosts summer concerts, a swimming beach, and a chutes and ladders playground that is a terrific hit with the kids. Houghton's RV Park is located just west of the Waterfront Park. Each of the 24 camp sites has a waterfront view, a covered patio with a picnic table and bench, a paved parking area, and full hook-ups. 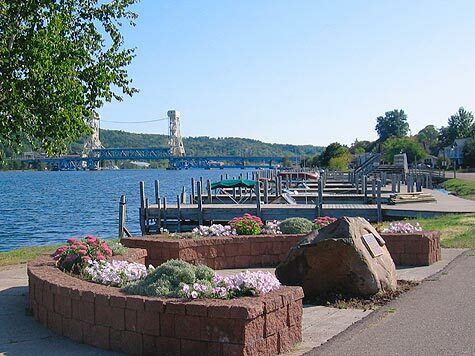 See our Travel Links section for more info on Houghton's RV park. Go Here for the Houghton RV Park campground map. Across the waterway, just west of Hancock, the city of Hancock also has a campground and recreational area. They have a total of 70 sites, 52 with electric hookups and 18 exclusively for tents. Go Here for the Hancock RV Park campground map. West of Houghton on Lake Superior & the Portage Waterway. 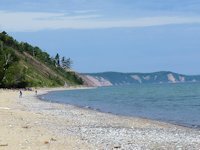 Scenic views, beautiful sand beaches, and a cooling night breeze off Lake Superior are among the features that make FJ McClain one of the more popular Upper Peninsula parks. All 98 campsites have electrical service. Reservations are recommended for July and August as well as September weekends. Go Here for a campground map of FJ McClain Park. The original historic Douglas House Hotel was built in 1860 and an addition was added in 1899 to serve the increasing prosperity resulting from the maturing of the copper mining industry. The addition included the Saloon with an arched ceiling and Tiffany chandaliers which survived the 1901 fire that destroyed much of the original structure . The rebuilt hotel operated until 1983 when it was converted to a senior apartment complex. However the Douglas House Restaurant & Saloon continue to operate and offer a unique dining experience. Inside the Keweenaw Brewing Company, you can have peanuts and beer and watch the brewing operation. Although they have no food service, you can order pizza for delivery to the Pub and bring other carry-outs from nearby restaurants. We've dined at and enjoyed the Ambassador for pizza and Italian food, enjoyed more elegant dining at the Library Restaurant & Brew Pub, and had terrific seafood at Joey's Seafood Grill. Sheldon's Pasties & Bakery is the place to go for this famous Cornish Miners meal. Go Here for a list of Houghton-Hancock Hotels & Motels and reservation information. The Portage Lake Golf Course is operated by Michigan Tech University. An 18 hole course, well maintained, with scenic views and an interesting variation in personality between the front and back nines. About 25 miles south of Houghton is another nice golf course, Wyandotte Hills. Four miles north east of FJ McClain park is the Calumet Township Park. Its beach is a favorite hunting ground for rock pickers and agate hunters. Love a Parade, Love Food? 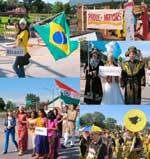 You'll enjoy Houghton's annual Parade of Nations and Ethnic Food Festival. Its amazing for a rather modest-sized community about as far north in the United States as you can get how many ethnic groups are represented in the parade. After the parade everyone joins up at Dee Stadium to sample the variety of food and enjoy multi-cultural entertainment. The annual event is held in September. 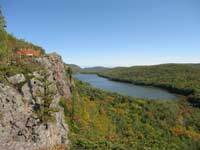 Brockaway Mountain and Eastern Keweenaw Keweenaw Scenic Drive page. Hiking, Camping, and unusual rock formations in Pictured Rocks National Park.